Pitt & I first met in September, 1943 at Dale Mabry Field, Tallahassee, Fla.
We went from Tallahassee to Thomasville, Ga. & from there back to Tallahassee. It was not until this second trip to Tallahassee that I became close to Pitt. There—Pitt, I , Rule, Conny Fagerland, DuBost, Franklin, & Marty—separated ourselves into one group & drew cards against other groups to see if we could go overseas. There were six groups of seven apiece & all wanted to go. But—we won or lost—as the case may be & were sent to Meridian, Miss. From Meridian we went to Savannah, Ga.
From Savannah we seven went to Camp Stoneman, Calif.
From Stoneman, we seven went to Hamilton Field at San Francisco & there Rule, Marty & Fagerland left ahead of us & went to a different Sqdn. Except for that one date of September 1943, the rambling list of places doesn’t give the kinds of specifics that are in Walt’s pilot log, and if it is all from Garner’s memory eight years after the fact, maybe it misremembers a few facts. The log gives us a lot more information, even though you have to dig to find some of it. 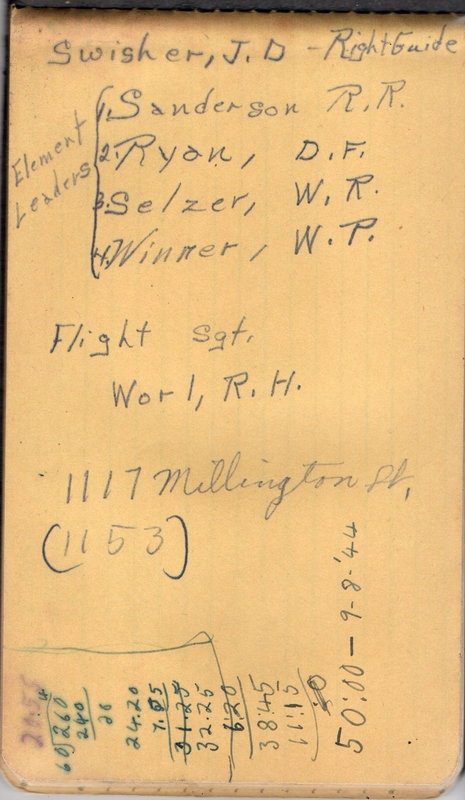 The only complete address Walt lists is the one on the flyleaf for Dale Mabry Field in Tallahassee FL, dated 14 October, but the log entries begin much earlier than that, and his first entries associated with Mabry Field aren’t until November 1943. So, maybe in October, he knew where he was going and noted the mailing address. But the log book itself was published in Oklahoma, and that’s where Walt’s training begins as noted at the end of that little diary from early 1943. 23 March-23 May 1943. Walt’s first flight training in Oklahoma, he flies a Fairchild PT-19A and logs 65 hours. 30 May-26 July 1943. Walt trains in a Vultee BT-13A and logs 85 hours. Most of the training flights are from Strother Field, but there are a few flights from such nearby fields as Stroud, Cassody, and Coldwell. 3 August-30 September 1943. Walt trains mostly in a North American AT-6 and logs 102 hours. In early September, he also pilots the P-40N for a few days. Most of the flights are from Eagle Pass, with one week in late September from Matagorda. Walt takes more time to enter the types of training at this location, such as aerobatics, different types of formations and instrumentation, and gunnery. 3 November 1943-29 January 1944. Walt flies a few times in the AT-6 and the BC-1–read about them in the development section of the article on the North American T-6 Texan. Mostly, in Thomasville, he trains in several models of the Bell P-39 Airacobra. Walt doesn’t actually list Mabry Field as any of his flight locations in the log, but Thomasville is one of several sub-bases of Mabry Field. The last entry for Eagle Pass, TX is 30 September, and the Thomasville, GA entries begin in November, so it’s likely that Garner is correct about when he met Walt at Mabry Field, and then they were sent off to Thomasville. The last two pages below show the last entry at Thomasville, then the beginning entries in Mississippi. 18 February 1944-13 April 1944. Walt continues training mostly in the Bell P-39 Airacobra, with a few days in the AT-6 and the BT-13. He notes that some of the training includes navigating at night and combat practice, as well as a lot of reconnaissance practice and aerial gunnery. 2 May 1944-23 May 1944. Walt spends less than a month in Kansas before heading overseas in June. At Marshall Airfield, he mostly flies the Bell P-39 Airacobra, with one day in the Douglas A-24 Banshee, the army’s version of the naval dive bomber. The dates and locations on the following pages are in question. They follow his training at Key Field, Mississippi, including the trainer’s signature, yet Walt begins the May dates as still being at Key Field. Were the first few days of May spent in MS or were they in KS? I’m not sure, but the entries here look like they belong together.